Meningiomas are most often slow growing and benign, but may also be malignant and aggressive. These tumors arise from the dura mater as do benign meningiomas, but tend to rapidly invade the brain and may metastasize to other parts of the body, especially the lungs. Unlike the much more common benign meningiomas, malignant meningiomas are equally distributed among men and women. The tumors, which are typically white and firm to the touch, often are associated with a significant amount of swelling (edema) and seizures. 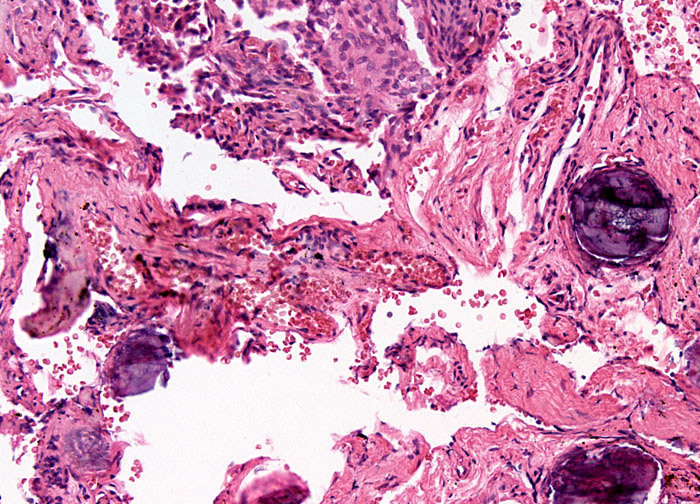 Under the microscope, necrosis of tissues can be seen. Malignant meningiomas are typically treated with surgery, though radiosurgery, which is a type of precisely targeted radiation therapy, is becoming increasingly common. Recurrence following treatment of malignant meningiomas is relatively high.